Laos, officially the Lao People’s Democratic Republic (ສາທາລະນະລັດ ປະຊາທິປະໄຕ ປະຊາຊົນລາວ), is a landlocked country in Southeast Asia, bordered by Burma and China to the north-west, Vietnam to the east, Cambodia to the south, and Thailand to the west. Its population was estimated to be around 6.5 million in 2012. 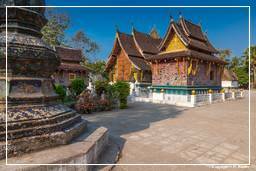 Laos traces its history to the kingdom of Lan Xang, which existed from the 14th to the 18th century when it split into three separate kingdoms. In 1893, it became a French protectorate, with the three kingdoms, Luang Prabang, Vientiane and Champasak, uniting to form what is now known as Laos. It briefly gained independence in 1945 after Japanese occupation, but returned to French rule until it was granted autonomy in 1949. Laos became independent in 1953, with a constitutional monarchy under Sisavang Vong. Shortly after independence, a long civil war ended the monarchy, when the Communist Pathet Lao movement came to power in 1975. The capital city is Vientiane. Other large cities include Luang Prabang, Savannakhet, and Pakse. The official language is Lao. Laos is a multi-ethnic country with the politically and culturally dominant Lao people making up approximately 60% of the population, mostly in the lowlands. Various Mon-Khmer groups, the Hmong, and other indigenous hill tribes, accounting for 40% of the population, live in the foothills and mountains. It is a member of the Asia-Pacific Trade Agreement (APTA), Association of Southeast Asian Nations (ASEAN), East Asia Summit and La Francophonie. Laos applied for membership of the World Trade Organization (WTO) in 1997, and on 2 February 2013, it was granted full membership.